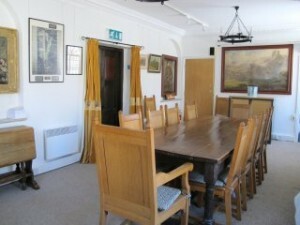 The Town Hall Meeting Room can be booked for talks, meeting, courses, small exhibitions and so on. However numbers are limited, so no more than 20 – 25 people at one time. There are tea & coffee making facilities, seating, a large table and a WC. The entrance to the Town Hall Meeting Room is through the grounds of St Edward’s Church. We charge £25 per session, with a reduction to £50 for a full day, (£30 for locals). Sessions can be booked by sending a completed booking form and deposit to Mr John Lindsay at the address above.